Renee’s trial experience is in the area of civil defense litigation, focused on insurance defense and professional liability (malpractice) defense. She handles a variety of insurance and business suits, including premises liability, construction litigation, and contract disputes. 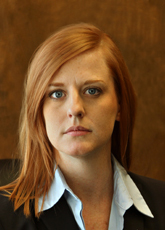 She defends health care providers and businesses in litigation throughout the State of Nebraska. She represents businesses in workers’ compensation litigation as well. She has tried jury cases throughout the state of Nebraska and has argued before the Nebraska Court of Appeals and the Nebraska Supreme Court.